a girl and a glass: Surprises are fun! On Wednesday night I had a surprise. Hubby and I carpool and drive in to work. We start pretty early in the morning so we can leave before the worst of peak hour really takes hold. On Wednesday afternoon he arrived at my office and informed me that the traffic was 'banked up for miles' due to the rain. (Don't get me started on the driving habits of Sydney-siders in the rain... Unless you have a bottle of wine for the rant!!!) Making the most of the opportunity we decided to grab a quick bite to eat in the city and wait out the worst of the traffic. This lead to a delightful dinner with another colleague, a delightful steak, and a lovely surprise bottle of wine. I must admit I've had this one before, but the thing that made it so nice was that I wasn't expecting dinner out. In fact I was expecting to have to cook. I wasn't expecting to have wine. In fact I was expecting to go for a run. I wasn't expecting delightful company - other than my husbands. All in all it was a great surprise night out. 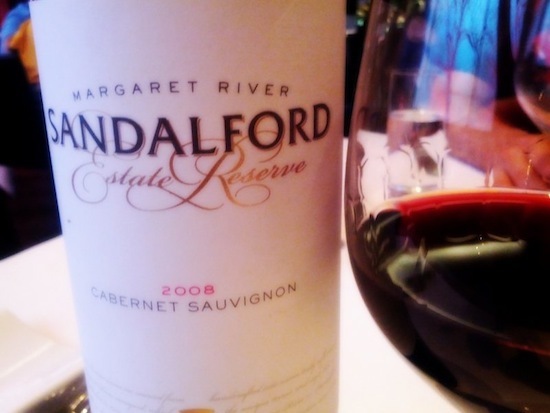 I won't be surprised it I try a few more wines out from Sandalford. I think I need to see what else they are capable of. I went to Sandalford in my twelve hours in Perth. I remember really liking the Element Late Harvest. It was a great not too sweet wine for drinking without food while hanging out on a nice summer day. Could probably pair it with some foods too. Thanks Andy. I'll have to try some.